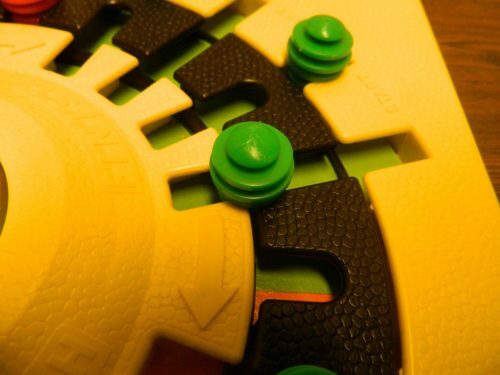 All of the pegs are put into their corresponding start spaces on the gameboard. 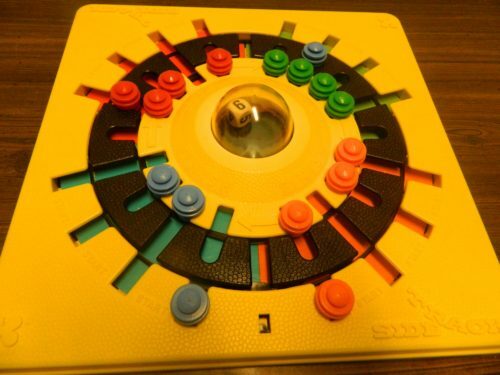 Each player pushes the Pop-O-Matic to roll the die and whoever rolls the highest number starts the game. To begin a player’s turn they press the Pop-O-Matic to roll the die. Before moving the track the player can choose to move one of their pieces from a start space or the inner track onto the middle track. The blue player has moved one of their pieces from the start space to the middle track. The player then turns the track the number rolled on the die. Each space turned should make a clicking sound. The blue player rolled a six so they turned the track six spaces. After turning the track the current player looks to see if any of their pieces are lined up with one of their own empty finish spaces. If so the player can push the piece into the finish space. At the end of the green player’s turn one of their pieces landed on one of their empty finish spaces. The green player gets to slide this piece into the finish space. If at the beginning of a player’s turn they have a piece that can be moved onto the middle track in a space occupied by another player, they can push their own piece onto the track and push the other player’s piece into the inner ring (if it is unoccupied). The blue playing piece was in front of the start space of one of the red pieces. 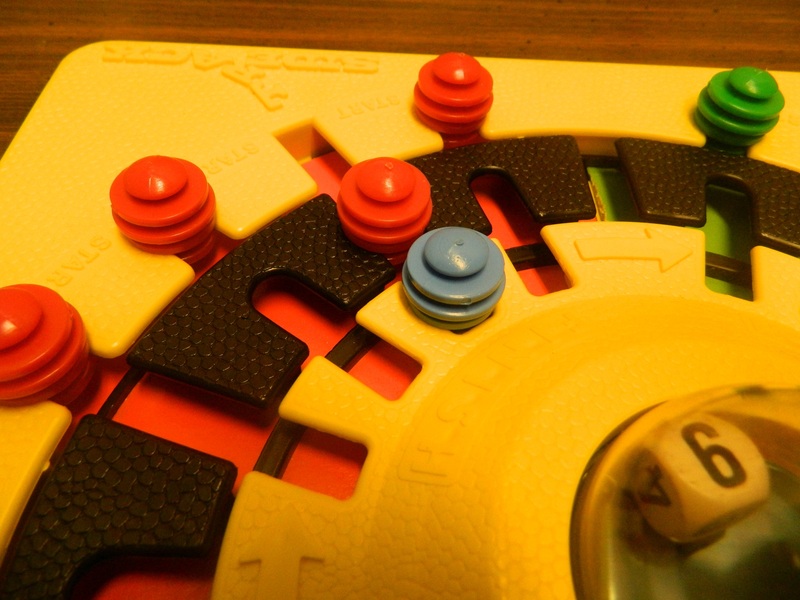 The red player decided to move that piece onto the middle track sidetracking the blue piece onto the inner track. Side Track ends when one player moves their final piece into their last finish space. This player wins the game. The green player has gotten all of their pieces into their finish spaces. The green player has won the game. The Kohner Bros. company’s claim to fame was the Pop-O-Matic dice popper. 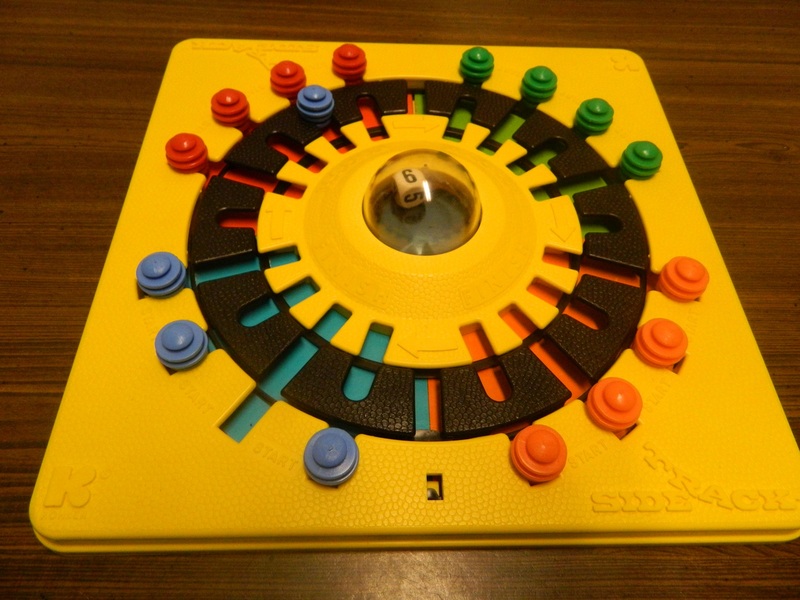 Made popular by games like Trouble, the Pop-O-Matic dice popper was a contraption where a die was placed inside a popper and when players pressed on the top of the popper it would shake the die. 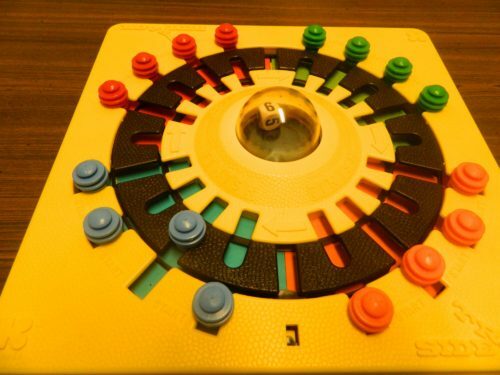 The novelty of the Pop-O-Matic is that it helped prevent children from losing dice and honestly is kind of fun to use. Who doesn’t remember the classic popping noises from these games. After creating the Pop-O-Matic, Kohner Bros’ focused on making a lot of game that would feature it. Side Track is one of those games. Unfortunately Side Track is not a good game due its’ total lack of decisions to be made and its’ reliance on luck. Probably the biggest problem with Side Track is the fact that the game has essentially no decision making. All you do in the game is roll/pop the die, place a piece on the middle track, and move the track the number of spaces rolled. The only step where you can make any decisions is deciding which (if any) piece you want to move onto the middle track. This isn’t much of a decision either since if you have an opportunity to put a piece on the middle track I see no reason why you wouldn’t. The decision then comes down to which piece to move onto the middle track which doesn’t really matter much since you have no idea what is going to happen on the future turns. That brings us to the game’s reliance on luck. Since you don’t really make any decisions in the game, the winner is whoever is the luckiest. Rolling high numbers doesn’t matter in Side Track but luck comes into play by rolling the right number at the right time. Basically you just roll the die and hope to roll the number that you need to get one of your pieces to a finish space. Towards the middle of the game the board becomes pretty congested which adds more luck because a player could get stuck in a situation where they can’t get some of their pieces out of their start spaces because they are constantly blocked by other pieces. Basically the game becomes an exercise of moving the pieces around and around until a player is lucky and gets to put one of their pieces in a finish space. This makes the game quite dull for adults. I think it might fare a little better with families that have young children though. The game has a recommended age of 7+ but I really don’t see why younger children couldn’t play the game. The game has so little strategy that I don’t know why the game couldn’t be played by children that are old enough to play any roll and move games. 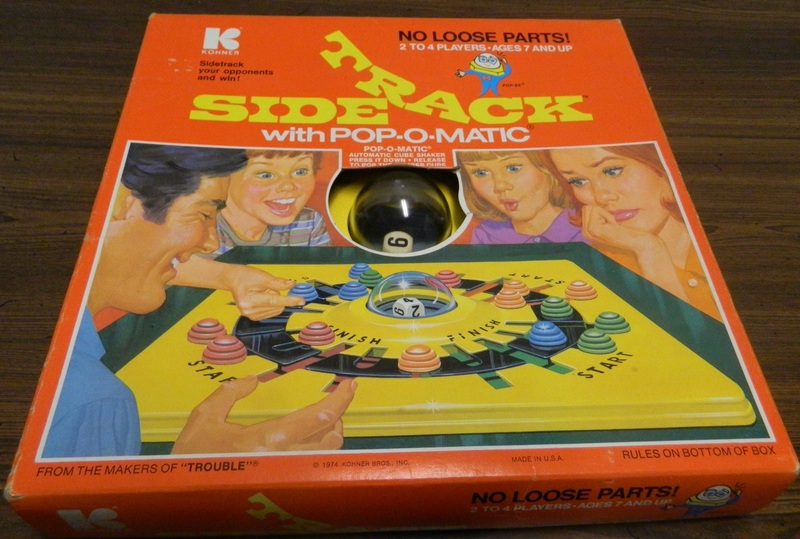 Children could enjoy the game more than adults due to the simplicity and who doesn’t like to pop the Pop-O-Matic die. As far as the components are concerned, Side Track does some things right while other things could be improved. I think it was a good idea to have all of the pieces connected to the board so they can’t be removed. The only way to remove the pieces would be to seriously damage the board. You shouldn’t ever have to worry about losing any of the pieces. The gameboard also seems to be pretty durable since despite being over 40 years old, the copy of the game I found still works well. The problems I have with the gameboard come from the fact that all of the pieces are attached to the board. Unless it was just my copy of the game, the track takes a lot more effort to turn than I would have thought. Resetting the game also takes quite a bit of time since you need to get the pieces onto the middle track and then move each piece to a corresponding start space. 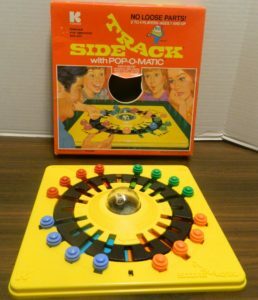 In my opinion Side Track is not a good game. It is your typical roll/pop game with a gimmick that differentiates it from other roll and move games. Unfortunately that gimmick really doesn’t add anything to the game. The game relies entirely on luck since there are no real decisions in the game and the decisions you do make are quite obvious. The game is just boring as the playing pieces go round and round until one player is lucky enough to get all of their pieces to stop on their finish spaces. Due to the simplicity children may enjoy the game but I don’t really see adults enjoying the game. If you have young children or have fond memories of the game from your childhood it may be worth picking up Side Track. Otherwise I would only pick up the game if you really like roll and move games and can find it for really cheap. If you would like to purchase Side Track you can purchase it on Amazon here . Since all pieces are attached to the board it is impossible to lose the pieces. Has next to no decisions to make. Relies almost entirely on luck.